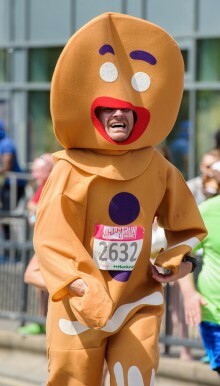 The runner in the gingerbread man suit in the picture is not one of us. That runner is an absolute legend. 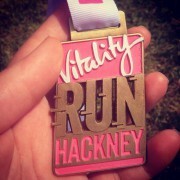 If you were out and about on the day of the Run Hackney half marathon you’ll know why – it was HOT! Hot in a stifling, muggy, no breeze kind of way. It was too hot to be sittng in a park, so running in full sun around our beloved Hackney as the heat radiated off the pavements and buildings and we counted the distance by the water stops was a next level kind of hot. Hell, even spectators were passing out from the heat (although we’d like to think it was from the sight of our legs!). The very thought of donning a gingerbread man suit and running 13.1 miles that day would be enough to make us sweat even if we were sitting stock still in a deep freeze with an air conditioning unit blasting in our faces. We salute that runner! Whoever you are, you are bonkers, but we salute you. Given the weather conditions on the day, luckily for us and our sweat glands, we didn’t reach our fundraising target before our run so we didn’t have to follow through on our promise to run dressed as cakes. We did have our eyes on a fetching little cupcake number with a cherry for a hat, but rules are rules and we weren’t even close to raising the money we’d hoped to so we had to settle for some rather snazzy Free Cakes for Kids Hackney vests instead, thanks to some last minute super service from Kustom Clothing. Even more luckily for us, our friends, family and supporters pulled out all the stops and we totally smashed through our target after the race, whoop, which absolutely made the sweat worth it. We particularly loved the donation from a random stranger who saw our vests on the day, looked us up, found our fundraising page and donated. And as if that wasn’t fantastic enough, he actually came back to our site and chucked another tenner our way just to ensure that we tipped over our target. What a sweetheart. If you’d asked us immediately after the run if we’d do it again then we’d quite possibly have said no as we yanked our hot feet out of our trainers and mainlined water as the sweat dried in white crystals on our faces, but now? Now there’s a little distance between that day and today … well, let’s just say that we couldn’t resist pre-registering for next year! Perhaps we’re mad, but running through our own borough’s streets with thousands of other runners, and even more people cheering us on, playing their steel pan drums, hosing us down, handing out water and Haribo and high fives, was the stuff goose pimples are made of. We may be soppy fools but it was far more than just a run to us. 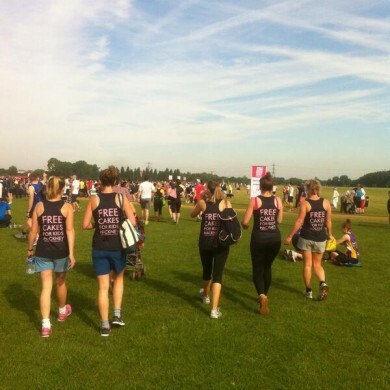 So thank you for the support on the ground on the day and thank you for the financial support – you’ve totally covered our running (no pun intended) costs for a whole year. 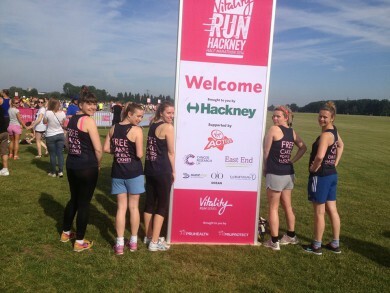 And huge, huge thanks to our runners: baker Lucy, super sisters Hannah and Zoe, and Sophie and Tess from our committee. WINNERS! Same place, same time next year? !